Set in the picturesque and historical Dordogne region of France, Le Grand Dague has been specially designed for lovers of luxury camping. 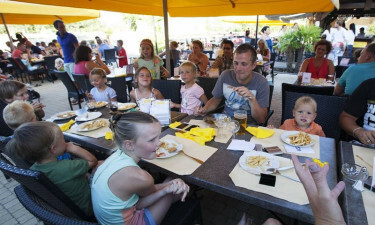 In addition to first-rate facilities and state of the art mobile homes, the camping site also offers guests a wide range of activities for people of all ages and from all walks of life, while Le Grand Dague is famous for its excellent restaurant and fully stocked bar. Why choose a camping holiday at Le Grand Dague? The pretty lagoon-style outdoor swimming pool features a water slide that even younger children can safely use. 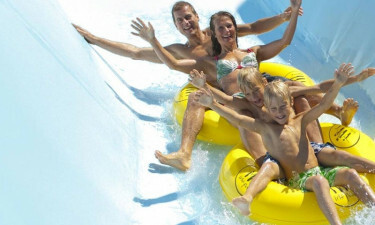 Messing about on the crazy river provides fun for all the family, while the swimming pool also comes complete with a special hydro massage area and Jacuzzi. Water aerobics and other types of aquatic activities are organised by staff to help families have fun in the sun. A whole host of different types of entertainment options are provided to make sure that there will never be a dull moment while staying at this luxury camping site. 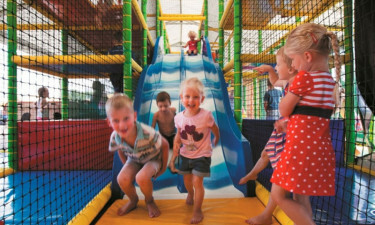 There are several different children’s clubs here where little ones of all ages can play and take part in a wide range of activities. Onsite staff are provided to take care of the kids while their parents have fun on their own, and some of the activities that adults are sure to enjoy include mountain biking through the countryside, getting into shape by practicing yoga and Pilates, and playing table tennis. People who really want to get to know Dordogne will be able to embark on a large number of interesting excursions while using this LUX-camp as a base. Nature lovers will want to allow plenty of time to explore the large and lovely Regional Nature Park Périgord Limousin. There are more than a thousand castles in the area that are just waiting to be explored, with highlights including Castlenaud, Puymartin and Hauteford. Excursions can also be arranged to explore the picturesque valley of Bandiat, which features several impressive watermills and charming traditional villages. Dordogne is celebrated for its delicious traditional dishes and guests will never have to wander far from their mobile home in order to sample the best that this part of France has to offer. All dishes are created using fresh local produce and include grilled fish, juicy steaks and salads. People who are looking for a taste of Italy will be able to indulge at the onsite pizzeria, while the bar boasts an excellent selection of French and international beers and spirits. People who want to pick up local produce so that they can pack a picnic to take with them when they go exploring will find an excellent selection of goodies in the onsite grocery shop. This is also a good place to find toiletries and souvenirs, while freshly baked bread can be purchased here each morning.